The slow growth of worker incomes since 2000 has been the subject of intense policy and political debates. 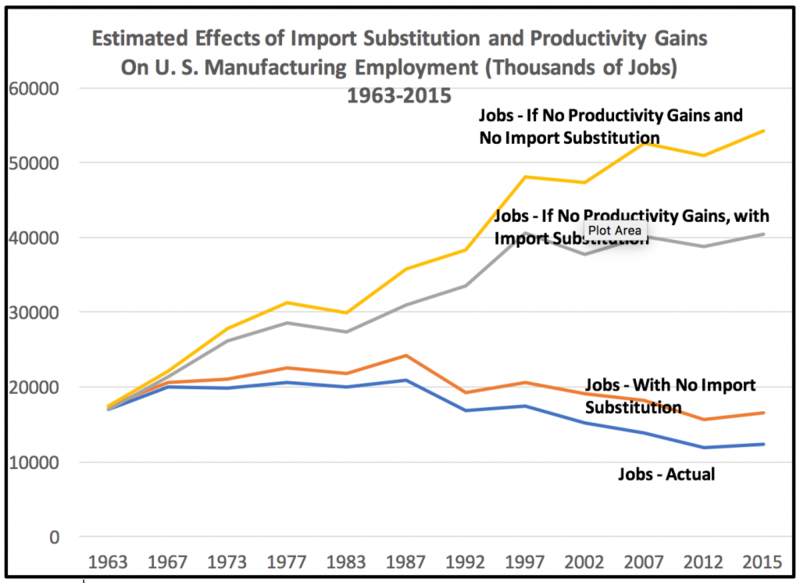 One of the clear messages of the 2012 Presidential campaign was the call to remedy perceived distortions in world trade that have disadvantaged American workers, particularly those had in the past held jobs in manufacturing industries. The electoral discontent that arose, in part, from the weakness of the national economy played a significant role in the outcome of the recent Presidential election. Nationally, the economy has suffered a bumpy ride during the current century, as the loss of manufacturing employment has cost more than five million jobs since 2000, and the country suffered two recessions, one in 2001, after the 9/11 attacks and the other in 2008, with the collapse of the country’s financial markets. Average annual private sector employment growth dropped from 2.5% between 1979 and 2000 to 1.3% between 2000 and 2015. Average earnings per employee only increased by 1.9% in real dollars in the entire period between 2000 and 2015 – slightly more than 1/10th of one percent annually. Given the lackluster performance of the U. S. economy, and the stagnation of worker earnings during the current century, how have local government employees fared? As it turns out, remarkably well. In fact, their earnings have shown steady growth, both in the latter part of the 20th century, when private sector employment and earnings were increasing relatively quickly, and during the current century, when they have stagnated. In 1979, private sector workers and local government employees had average earnings that were nearly equal. In 2015, nationally, local government employees’ average earnings were nearly 30% higher than private sector workers. In New York State, the gap between average private sector earnings and the earnings of local government employees is far higher – in the Buffalo-Niagara Falls MSA local government employees’ earnings averaged $87,588 in 2015, while private sector earnings averaged 49,949, a difference of 75%. In Utica-Rome local government employees averaged $68,979, compared with $41,186 for private sector workers – a difference of 68%. This post examines earnings of local government and private sector employees between 1979 and 2015. Earnings are defined as wages and supplements to income, like health insurance and pension costs, and are a better measure of the total value of employee compensation than wages alone. The data for private sector workers does not include farm workers. Earnings are adjusted for inflation, and are shown in 2015 dollars. Over the thirty-six-year period between 1979 and 2015, real dollar earnings per employee in all metropolitan areas nationally increased on average by $10,948 (23.4%). Real dollar earnings increased in most New York metropolitan areas, but by sharply varying rates. The New York/New Jersey metropolitan area had the strongest growth in the state – 38%. Albany -Schenectady-Troy’s growth was second strongest – 22.3%. Other upstate areas had growth that was significantly less than the average for metropolitan areas overall, but in most cases, New York metropolitan areas did see real private sector employee earnings growth. The Binghamton, Kingston and Watertown MSA’s had losses. Average private sector earnings per employee in most New York metropolitan areas declined significantly compared to the average of all metropolitan areas over the 1979-2015 period. In 1979, average private sector earnings in large upstate metropolitan areas, like Buffalo, Rochester, and Syracuse were at or above the average. In 2015, average private sector earnings were 14% below the national metropolitan average in the Buffalo MSA, 9% below the national average in the Rochester area, and 11% below it in the Syracuse area. The New York City MSA was the only area to significantly exceed national growth – from 13% above the average to 28%. Between 1979 and 2000, private sector real earnings per employee in U. S. metropolitan areas increased by 18.9%, 0.8% annually on average. In the recent 2000-2015 period, private sector earnings per employee essentially flatlined, growing only by $1,073 – 1.9% nationally. New York’s metropolitan areas generally reflected the slowdown of earnings growth, though their results varied. Elmira did the best, with earnings per private sector employee growing by 14% between 2000 and 2015. Albany-Schenectady-Troy also saw significant earnings growth – up 8.7%. Other metropolitan areas saw much less growth, and in some cases decreases. The New York metropolitan area had a decline of almost 6% in earnings per private sector employee, but the regions’ earnings were still substantially higher in 2015 than the average for all metropolitan areas – $74,510 vs. $57,810. 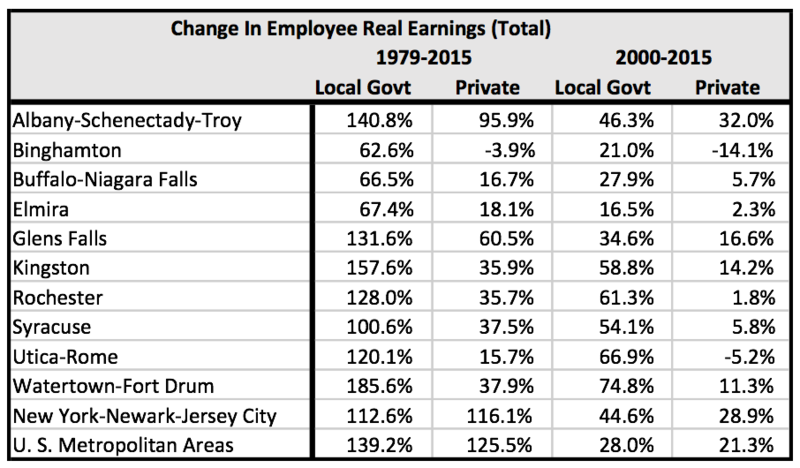 Local government employees have seen significant increases in real earnings from 1979 to 2015 nationally and in New York State. During that period, average earnings increased from $48,862 to $74,576 – an increase of 59%. The real earnings of private sector employees also increased, but by only one third as much – 21% – from $47,737 to $57,810. In 1979, local government and private sector earnings were nearly equal, but by 2014, local government employees had a 29% advantage in compensation, nationally. 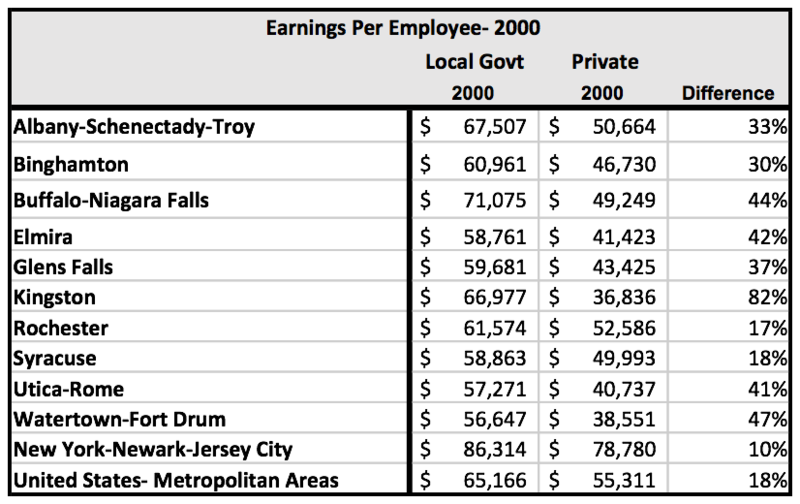 Local government employees in New York State metropolitan areas had much greater increases in earnings between 1979 and 2015 than the average for United States metropolitan areas – in the Albany, Schenectady, Troy metropolitan area, earnings per employee doubled, and in Watertown and Kingston, they more than doubled. 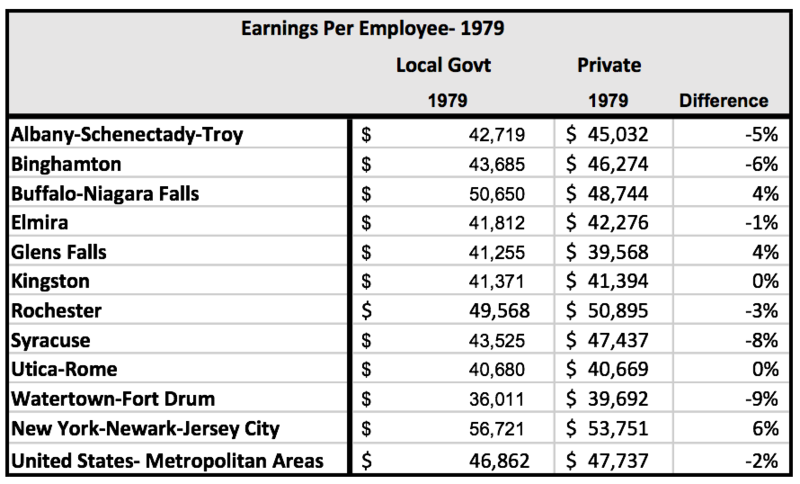 In 1979, most metropolitan areas in New York State had average earnings per local government employee that were below the average for metropolitan areas across the nation. Only Buffalo-Niagara Falls, Rochester and New York/Newark/Jersey-City were above the average. Because of the rapid growth of local government earnings in New York metropolitan areas, by 2015, all New York metropolitan areas, except Glens Falls, Utica-Rome and Watertown were above the average for metropolitan areas across the nation. While earnings of private sector employees showed only a 1.9% gain between 2000 and 2015, local government employee incomes increased by 14.4% on average in metropolitan areas across the nation. In New York State, the increases were much larger – 27% in the Albany, Schenectady, Troy metropolitan area, 33% in the Rochester MSA and 45% in the Syracuse area. 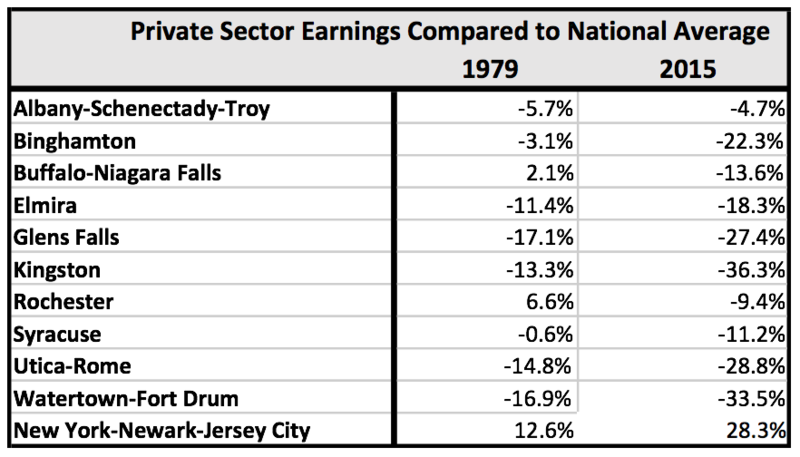 In 1979, private sector employees nationally and in New York State on average had earnings that were like or slightly exceeded those of local government workers. By 2000, there was a significant difference between average earnings for private sector and local government employees: on average, local government employees earned 18% more than their private sector counterparts. The difference in earnings was larger in many metropolitan areas in New York State – in the Albany-Schenectady-Troy MSA it was 33%, while in Buffalo-Niagara Falls, it was 44%. Overall, loc al government employment grew more slowly than private sector employment in both the longer 1979-2015 and shorter 2000-2015 periods. While results in New York State metropolitan areas varied, they followed a similar pattern – most showed slower local government employment growth than in the private sector. During the 1979-2015 period, local government employment grew at about 60% of the rate of private employment growth – 53% compared to 91%. In the 2000-2015 period, local government employment grew on average about 9%, compared to 22% for private employment. Even though local government employee growth was substantially slower than private sector employment growth, overall local government employee real earnings increased slightly more than private sector real earnings in U. S. metropolitan areas during the period because of the large increases in local government real earnings per employee. Thus, local government employee earnings increased from 8.8% to 9.3% of the total of local government and private sector non-farm earnings during the 1979-2015 period. New York State metropolitan areas, other than the New York City/New Jersey metropolitan area had larger increases in local government employees’ shares of local government plus private sector earnings. For example, in the Kingston metropolitan area, local government employees’ share of earnings was 22.3% in 2015, compared with 13.5% in 1979. In the Rochester area, local government employees had 14.2% of the total in 2015 compared with 9% in 1979. During the 1979-2015 and 2000-2015 periods, the total earnings of local government employees increased by a greater percentage than that of private sector workers, both nationally and in New York State, but the differences were larger in New York State than the national metropolitan area average. 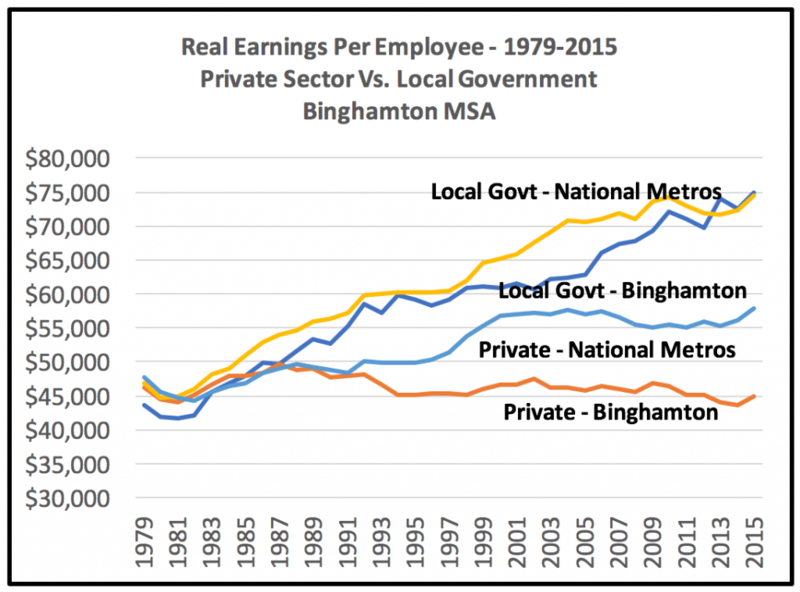 For example, in the Binghamton areas between 2000 and 2015, private sector employee earnings in the aggregate declined by 14%, while local government employee earnings increased by 21%. 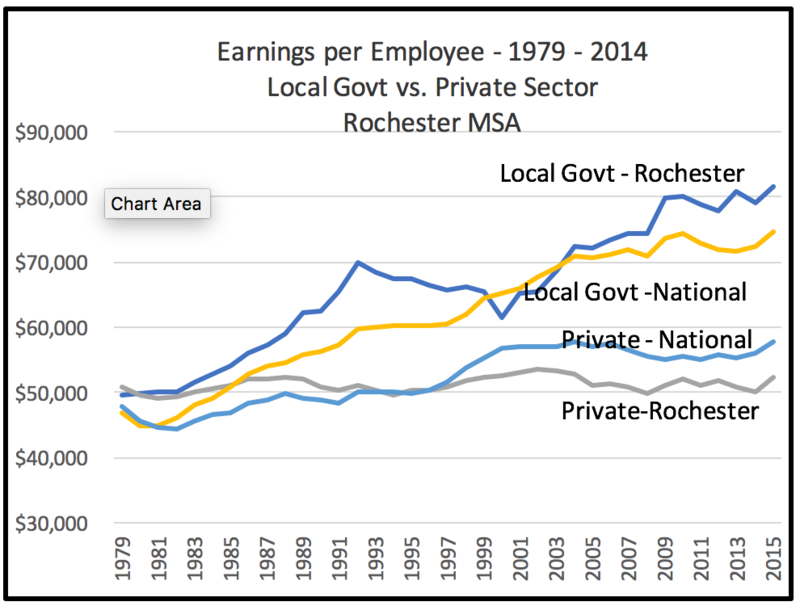 In the Rochester area between 2000 and 2014, private sector earnings increased by only 1.8%, but local government worker earnings increased by 61%. The contrast between the growth of total earnings of private sector versus local government employees was greater in 2000-2015 than in the overall 1979-2015 period. While both local government and employee earnings in the aggregate increased significantly in most metropolitan areas, during the 2000-2015 period private sector earnings in the aggregate showed relatively small gains or losses, while local government earnings in the aggregate continued to show double digit increases. 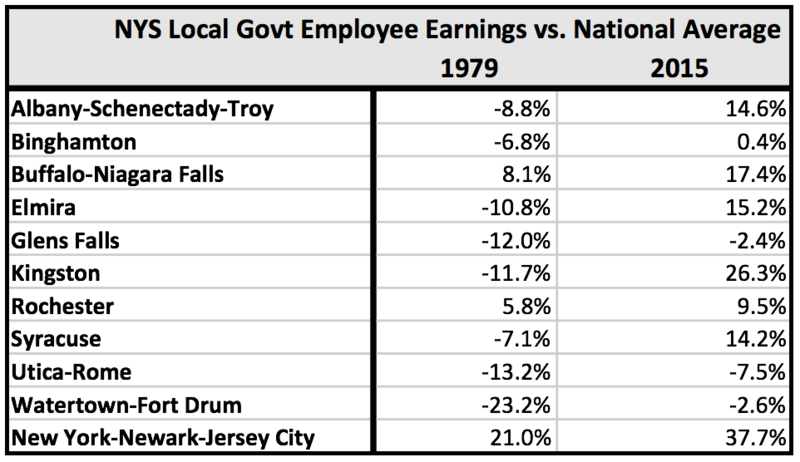 The data shows that local government and private sector employee earnings were similar in 1979, but that a large differential has developed, with local government employees averaging $74,576 in 2015 compared with $57,810 for private sector workers – a difference of 29%. It also shows that local government employees have been protected from the wage stagnation that has affected private sector workers in the United States since 2000, with average earnings increasing by 14%, compared with 1.9% for private sector workers. Local governments do not face the same level of competitive pricing pressure encountered by private sector employers who compete in local, national or global markets. Local government employees are highly unionized and enjoy the benefits of collective bargaining. While government employees are barred from striking in 39 states, including New York, courts and legislatures have granted them protections (like the Triborough Doctrine and Triborough Amendment) in the bargaining process that unions in the private sector do not enjoy. The largest employers among local governments are typically public schools, whose employees are largely professionals who are required to have college degrees to qualify for employment, and continuing postgraduate training. More educated employees in the private and public workforce have made greater wage gains than workers with less education. 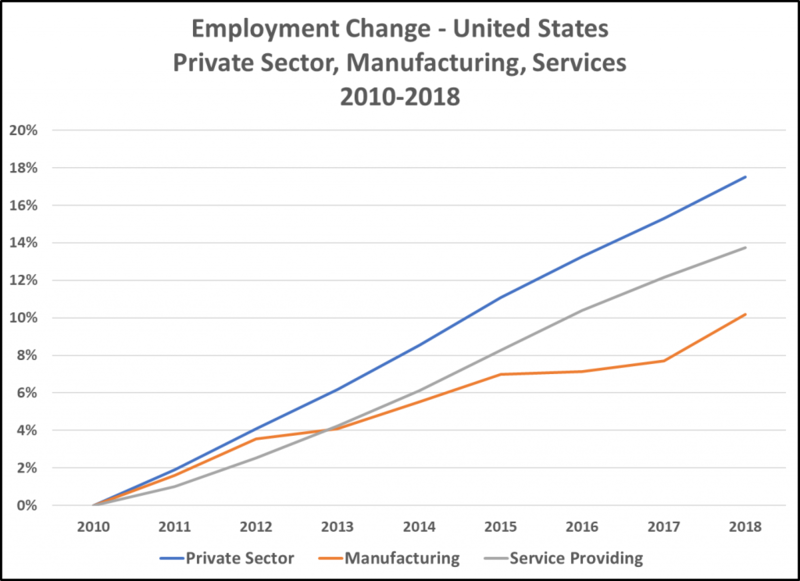 In areas like much of upstate New York, with large concentrations of manufacturing employment in 1979, private sector earnings growth has stagnated because of the shift from higher paying manufacturing employment to lower paid service sector jobs. The occupational mix among government employees has not shifted in the same way. Thus, in these areas some of the gap in earnings between local government employees and private sector workers is like to have resulted from the changes in occupational composition of the two groups. In most metropolitan areas in New York State, the contrast between private sector employee earnings stagnation and local government employee earnings growth has been greater than the average for all metropolitan areas, nationally. Most of these New York metropolitan areas had been heavily dependent on high paying manufacturing jobs, and have lost most of them. The jobs that have replaced manufacturing employment in areas like Binghamton, Buffalo, Rochester and Syracuse have been service sector jobs that pay less, on average, than the jobs that they replaced. 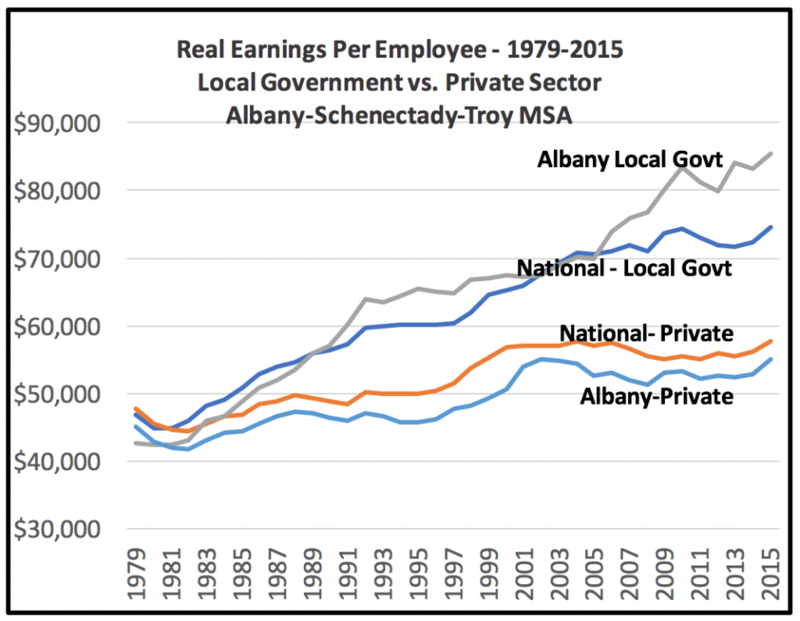 But the transition from manufacturing is not the only cause of the relatively greater gap between private sector and local government employee earnings in New York State. The second factor is the more rapid growth of local government employee salaries in most metropolitan areas in New York compared to the nation. For example, In Buffalo, local government employees earned 8% more than the national average in 1979. In 2015 the difference was 17.4%. 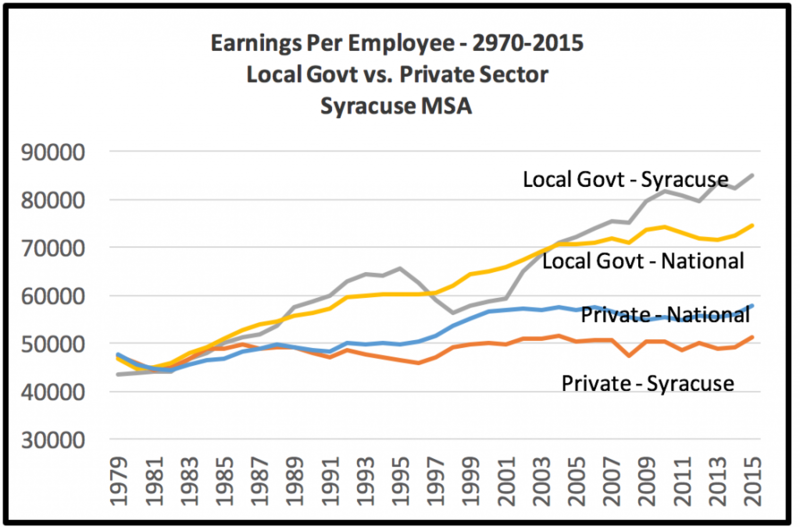 In Syracuse, local government employees had earnings that were 7.1% below the national average in that year. 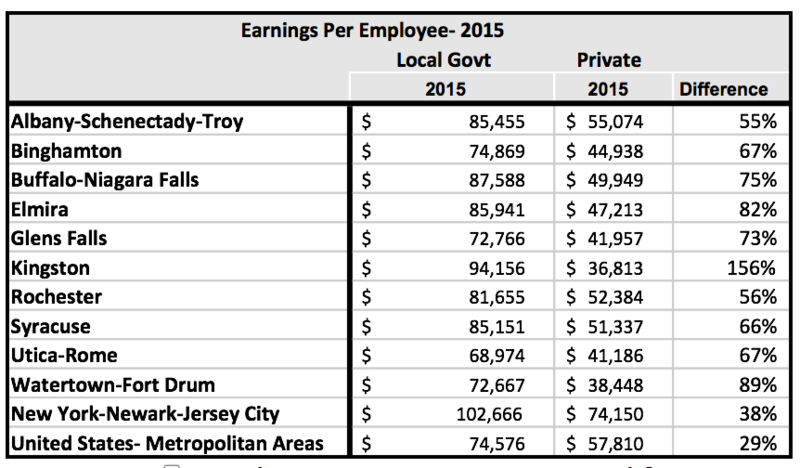 In 2015, Syracuse area local government employees earned 14.2% more than the national average. There is no single cause for the increasing disparity between the earnings of private sector workers and local government employees, but the increasing gap between local government earnings per employee and private sector earnings raises questions of affordability in communities where residents’ incomes are growing slowly, if at all. Because the differences in incomes are more pronounced in metropolitan areas in New York State outside New York City than elsewhere, the issue is particularly significant in Upstate New York. And, the relative affluence of the public employees whose salaries are paid by taxpayer dollars may lead to increasing resentment, and electoral insecurity for local government officials. Albany-Schenectady-Troy has historically been less dependent on manufacturing than most upstate metropolitan areas. Thus, private sector earnings in the area are significantly greater than they were in 1979 – $55,074 vs. $42,719. While the percentage growth in private sector earnings in the area was near the national average – 22.3% vs 23.4% — private sector earnings per employee remain below the national average of $57,810. Private sector employment growth during the period was relatively strong compared to other metropolitan areas in the state, increasing by 60% compared to 1979. Performance was relatively good during the 2000 to 2015 period as well, with private sector earnings per employee growing by 8.7% compared with 1.9% in metropolitan areas nationally. Private sector employment grew by 14.5% during the period. Local government earnings per employee grew substantially more than private sector employee earnings during both periods. In 1979, government employees’ earnings averaged 5% lower than private sector employees. By 2015, government employees’ earnings per worker averaged 55% higher. 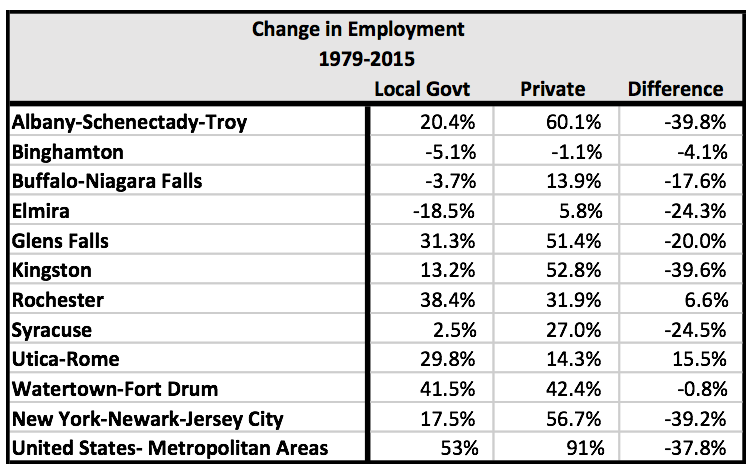 The growth of the gap in earnings between local government and private sector workers from 1979 to 2015 was greater in the Albany-Schenectady-Troy area than it was in metropolitan areas, nationally. 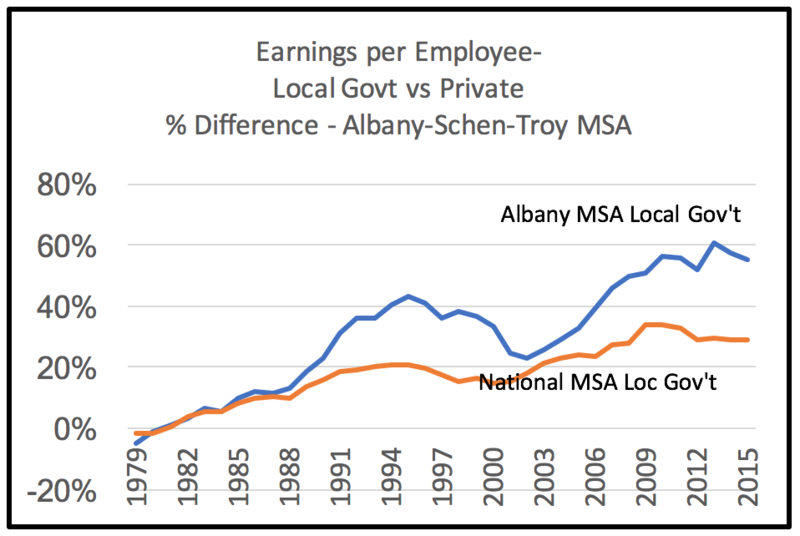 While there was little difference in the relationship between local government earnings and private sector earnings in the Albany area and nationally in 1979, there was a 26% difference between the two in 2015 (55.2% vs. 29.0). The periods where the gap between local government employee earnings and private sector earnings in the area increased most relative to the nation were between 1988 and 1994 and after 2003. 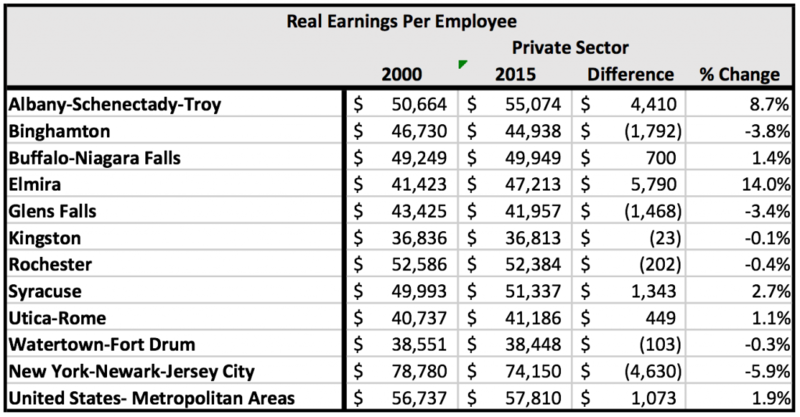 Between 2000 and 2015, private sector earnings increased by 8.5% in Albany – a relatively strong performance compared to the average of metropolitan areas across the nation, which had private sector earnings growth of 1.9%. Local government earnings per employee grew much more, however, by 26.6%. The Binghamton Metropolitan area is a relatively small metropolitan area (population – 251,725) that had a high concentration of jobs in manufacturing in 1970 – 42.2% of private sector employment. By 2014 the area had lost 28,600 manufacturing jobs, and manufacturing jobs were only 11% of the private sector total. 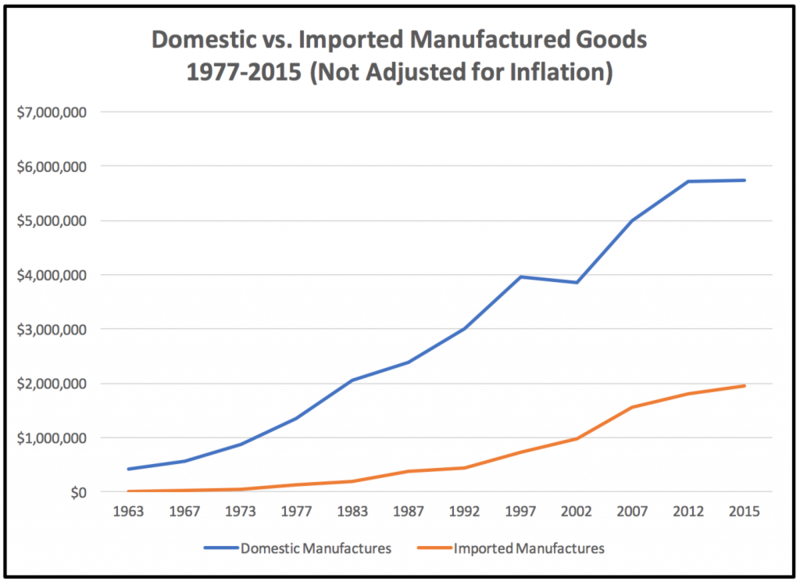 Because of the relatively small size of the area and its dependence on a relatively small number of large manufacturing businesses, its economic performance over the past fifty years has been very weak. Since 1979, the Binghamton area’s private sector employment has decreased by 4%, while per capita private sector earnings decreased by 3% to $44,938. Between 2000 and 2015, private sector employment decreased by 10%, while earnings per employee decreased by 4%. Local government earnings per employee grew strongly during the 2000 to 2015 period, increasing 22.8%. 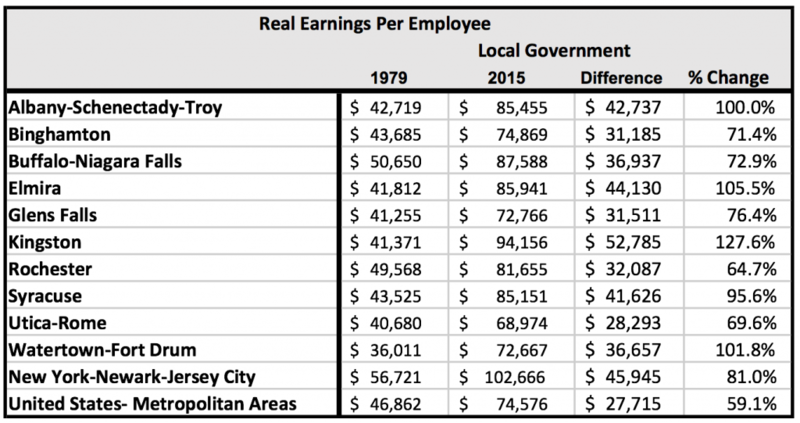 Despite the continuing decline in private sector jobs and earnings, local government employee real dollar earnings per employee increased from $43,685 in 1979 to $74,869 – 66% higher than the area’s private sector average of $44,938. 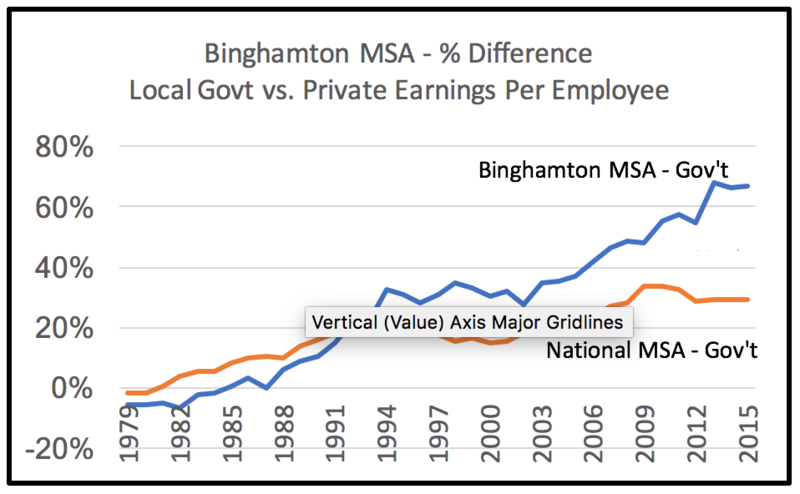 The gap between local government and private sector earnings in the Binghamton MSA is more than double that (29%) in metropolitan areas nationally. The Buffalo-Niagara Falls MSA has been hard hit by the loss of manufacturing employment over the past fifty years. In 1970, 36% of private sector employment in Buffalo-Niagara Falls was in manufacturing. By 2014, less than 10% of jobs were. 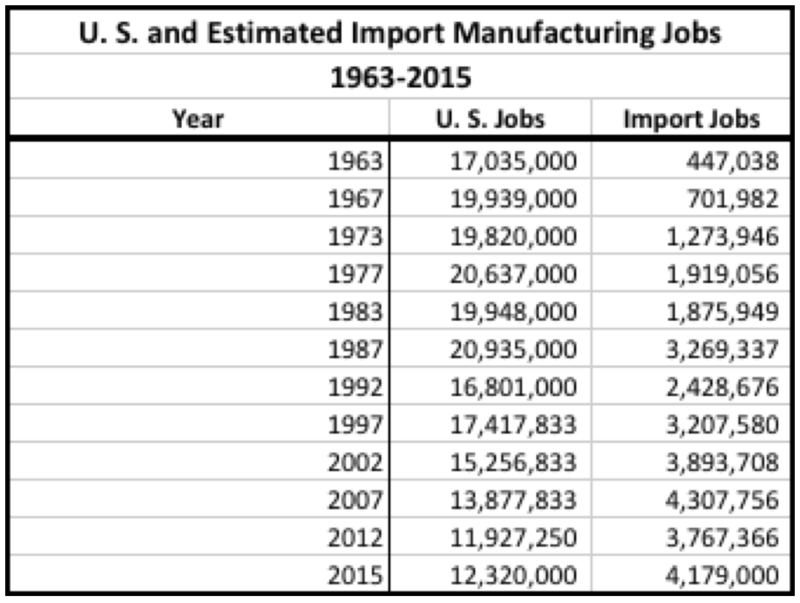 During the period, the area lost 121,000 manufacturing jobs. 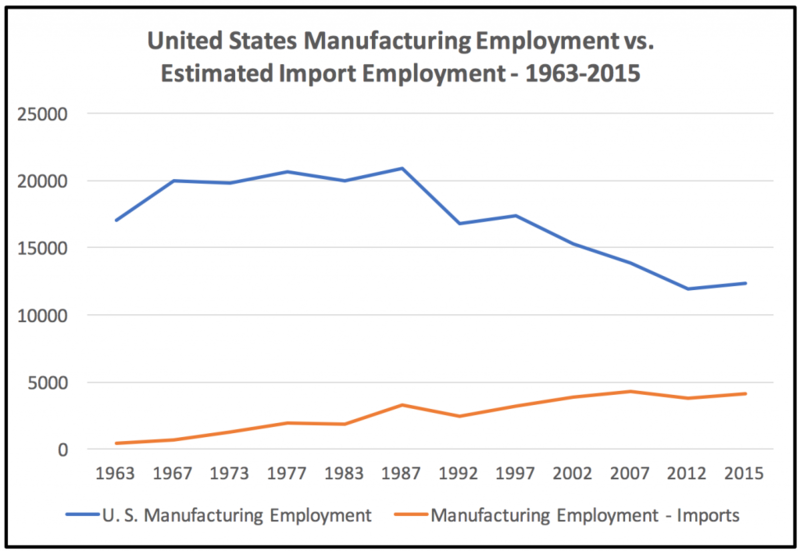 The result has been that thousands of people who in the past had access to relatively high paying manufacturing jobs had to find employment in service industries. In 2014, the earnings of workers in manufacturing jobs in Buffalo averaged $70,812, compared to $44,446 for jobs in the service sector. At the same time, employment growth in the area has been slow – private sector employment increased by only 14% between 1979 and 2015 compared with 91% nationally. Between 2000 and 2015, Buffalo employment grew by 4% compared to 22% in metropolitan areas nationally. But, local government employee earnings traced a different path. 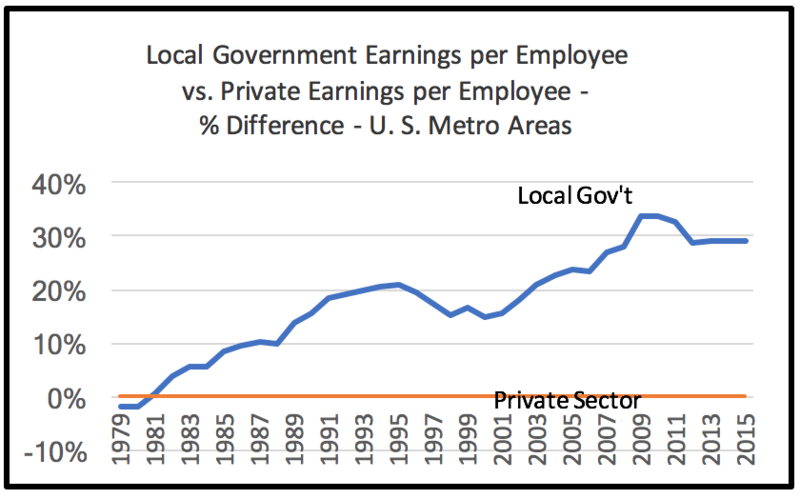 After increasing steadily from 1979 to 1991, local government employee earnings plateaued during the 1990s, resuming their upward trend in 2003. Thus, while private sector employees had real income growth of only 1% during the entire 1979 to 2015 period, local government employees’ earnings increased 73%. Between 2000 and 2015, local government employees’ earnings increased by 23% compared with 1% for private sector workers. 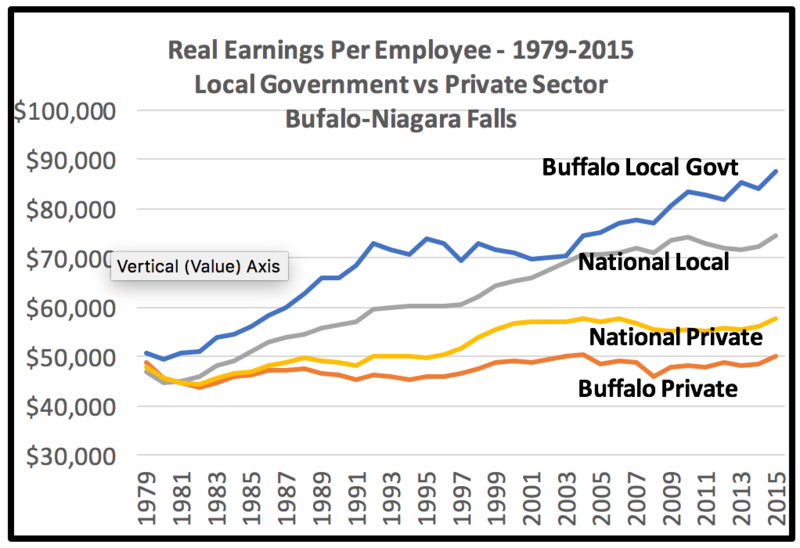 Between 1979 and 2015, the earnings of Buffalo area local government employees increased, more quickly than in other metropolitan areas and were significantly higher than the national average by the end of that period. During that same period, earnings of private sector workers in the area increased only slightly, with the result that they moved from the national average to significantly below it. 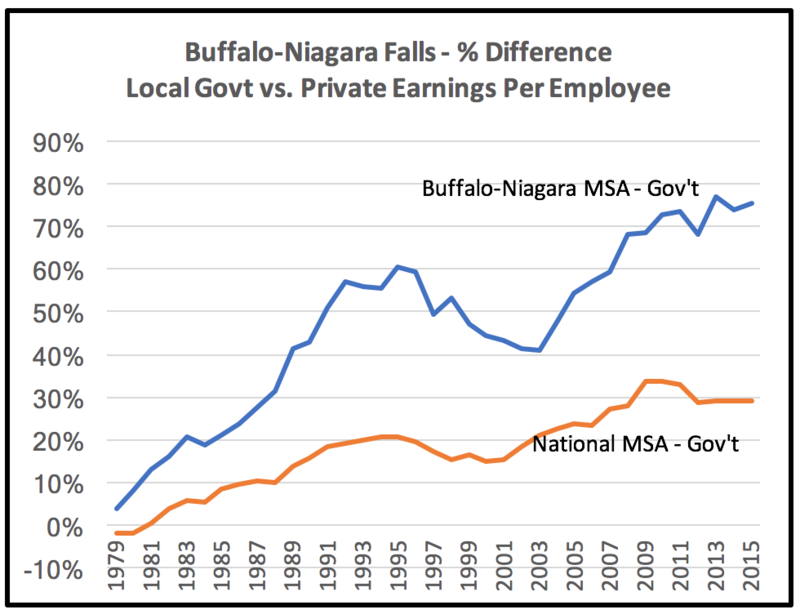 In 1979, Buffalo-Niagara Falls MSA local government employees averaged $50,650 compared with the national metropolitan average of $46,852 – an 8% difference. Private sector employees in the Buffalo-Niagara MSA earned an average of $48,744 in 1979 compared with $47,737 for the nation- a 2% difference. In 2015, Buffalo’s average private sector earnings ($49,949) were 14% lower than the national average ($57,810). In contrast, local government employees earned an average of $87,588 – 17% higher than the national average for metropolitan areas of $74,576. Thus, the gap between average local government employee earnings and private sector employee earnings in the Buffalo-Niagara MSA was 75.4% — two and one half times the average (29%) in metropolitan areas across the nation. Between 2000 and 2015 private sector earnings per employee in the Buffalo-Niagara Falls MSA increased by 1.9%. Local government earnings per employee increased by 23.2%. Unlike most metropolitan areas nationally since 2000, the New York/North Jersey metropolitan area has seen significant private sector job creation – 29% during the period. Since 2000 the area’s job creation performance was among the strongest of metropolitan areas in nearby states, exceeded only by Boston’s performance. Like the New York City metropolitan area, most of the places that showed strong employment gains in this century had large populations and small concentrations of manufacturing employment in 1979. Over the 1979 – 2015 period, average private sector earnings in the New York MSA increased by 39%. Average private sector earnings decreased by 6% during the 2000-2015 period. Even so, average private sector earnings in the area are 28% higher than the national metropolitan area average. 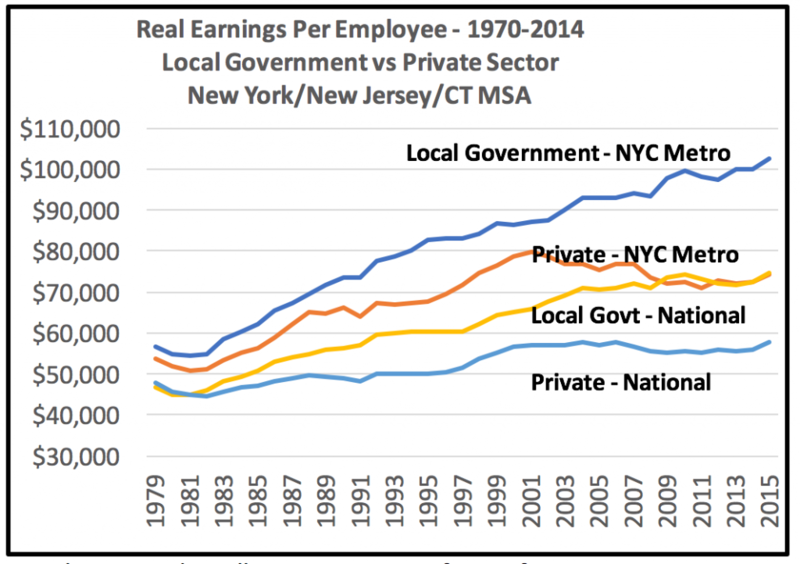 Despite the New York metropolitan area’s relatively good private sector performance, local government employees have done significantly better. For example, beginning in 2001, private sector earnings per employee decreased, but local government earnings increased by 19%. Average earnings per capita for local government employees in the area are $103,000, compared to $74,000 for private sector employees – a 38% gap. 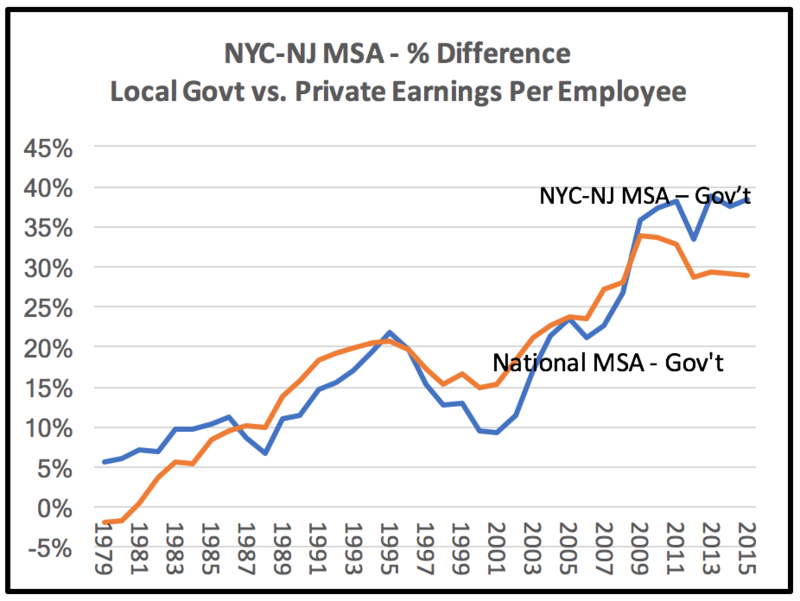 The growth of the earnings gap between local government employees and private sector workers has not differed greatly in the New York metropolitan area from other metropolitan areas across the nation. Although the difference between local and private sector employee earnings was somewhat larger in the New York City area at the beginning and end of the study period, over much of the time, differences were small. Like most other upstate metropolitan areas, Rochester was historically heavily dependent on manufacturing. Kodak and Xerox were both major employers in the Rochester area in the 1970’s. Today, neither has a significant manufacturing presence. Thus, Rochester has seen slow employment growth, and stagnant private sector earnings over the 36-year period between 1979 and 2015. In 1979, average private sector earnings in Rochester were 7% above the national average, at $50,985 in inflation adjusted dollars. By 2015, they were 9% below it, at $52,384. 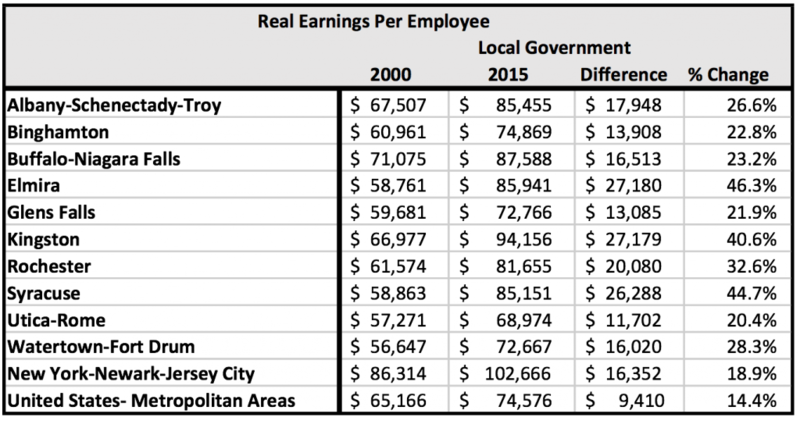 At the same time, real earnings of local government employees have substantially increased – from $50,895 to $81,665. Between 2000 and 2015, private sector earnings per employee decreased by 0.4% in the Rochester area. Local government earnings per employee increased by 32.6%. 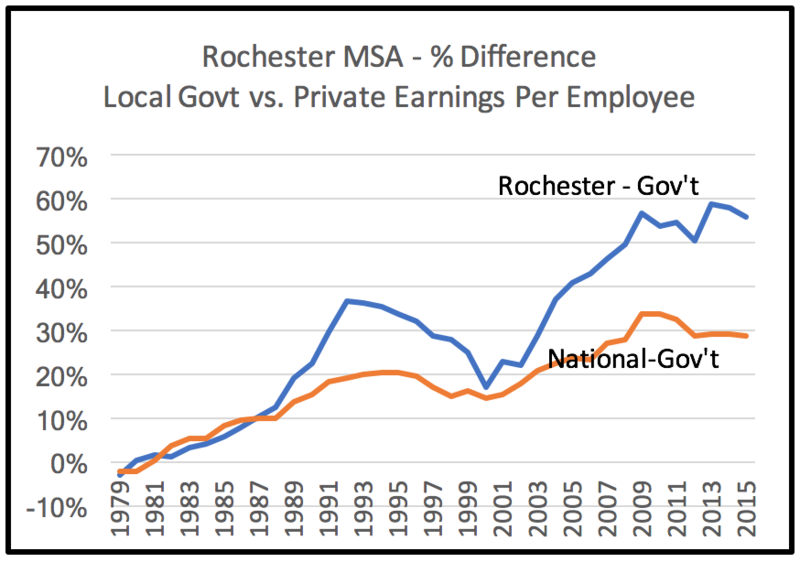 Because of the stagnation of private sector earnings per employee in Rochester and the steady growth of local government employee earnings, the gap between local government and private sector earnings in Rochester is substantially larger tha the average for metropolitan areas nationally – 56% vs.29%. Although Syracuse employment in the 1970’s was less concentrated in manufacturing than places like Rochester and Buffalo, manufacturing was important to the area in the 1970’s, with major employers including General Electric, General Motors and Chrysler having operations In the area. Like other areas that had a significant manufacturing focus, the area has seen little real private sector earnings growth over the 36-year period between 1979 and 2015. Real earnings in the Syracuse area for private sector employees averaged $47,437 in 2979. In 2015, private sector per employee earnings averaged $51,337. Nationally, metropolitan areas saw private sector real earnings per employee grow from $47,737 to $57,810. Between 2000 and 2015, private sector earnings per employee increased 2.7% in the Syracuse area. Local government earnings per employee increased by 44.7%. 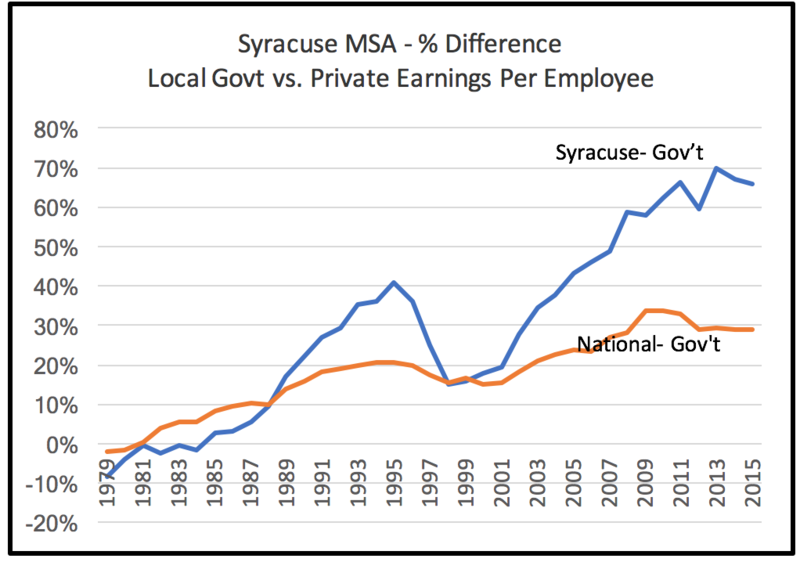 Local Government earnings per employee in Syracuse grew substantially between 1979 and 2015, despite private sector earnings stagnation. In 1979 local government earnings per employee were $43,525. By 2015, local government employee earnings had risen to $85,515. Like other places, earnings of local government employees rose sharply during the current century, increasing by 44.7% since 2000. By 2015, the gap between average earnings per local government employee and private sector employees’ earnings was 65.9% in the area, more than double the gap in income nationally. In 1970, nearly 38% of employment in the Utica-Rome area was in manufacturing. Since then, the Utica-Rome area has lost 29,000 manufacturing jobs, which now constitute 10% of the private sector total. 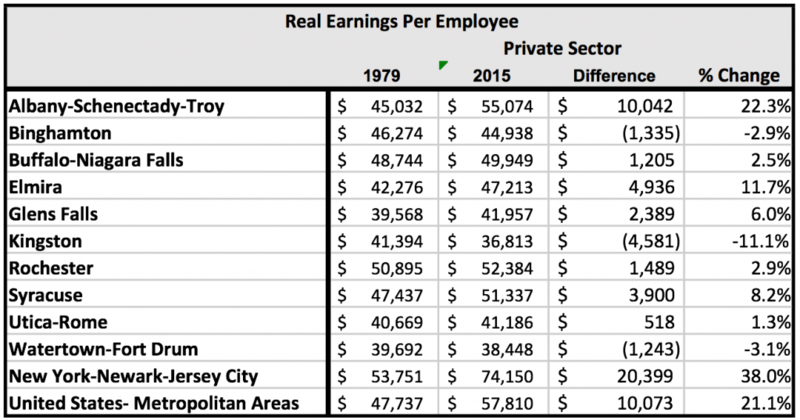 But, even in 1970, the Utica-Rome area had average private sector earnings per employee that were significantly below those in other upstate metropolitan areas. In 1979, Utica-Rome’s average private sector earnings per employee was $40,669, compared with $47,437 in Syracuse, which is one hour away by car. By 2015, the gap in private sector employee earnings was wider. In Utica-Rome earnings averaged $41,186, while in Syracuse earnings averaged $51,337. Utica-Rome’s relatively low private sector earnings level and growth are like other small metropolitan areas in the state. 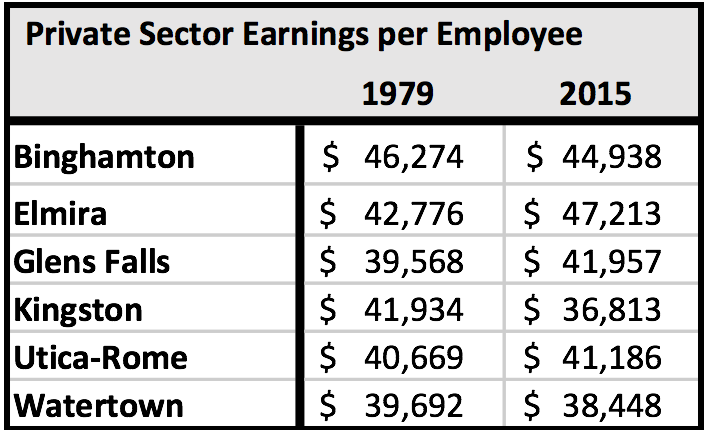 Both Watertown and Glens-Falls had average private sector earnings per employee that were below $40,000 in real dollars in 1979. Each is well below the national metropolitan average of $57,810 in 2015. 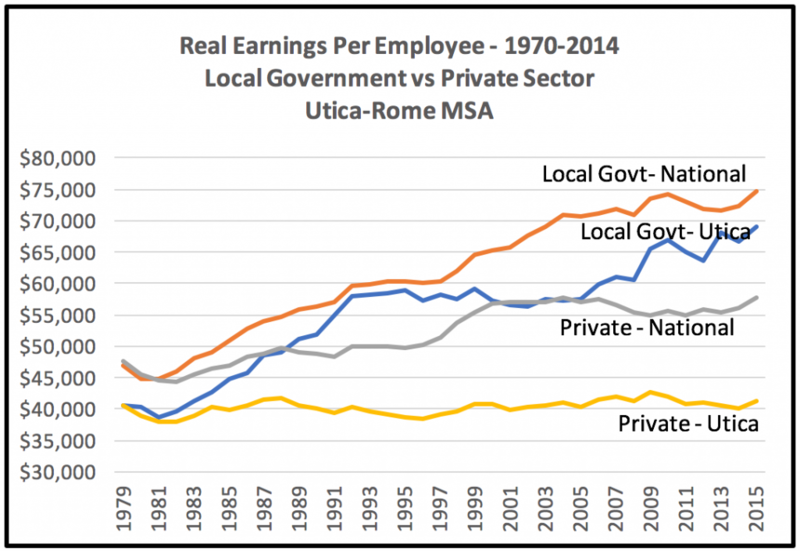 Earnings of local government employees, as in other metropolitan areas, have grown substantially in Utica-Rome, from $40,680 per employee in 1979 to $68,974 in 2015. While local government employee earnings have grown in the area, they remain below the national average of $74,576. Between 2000 and 2015, private sector earnings per employee in the Rochester area increased by 1.1%. Local government earnings per employee increased by 20.4%. 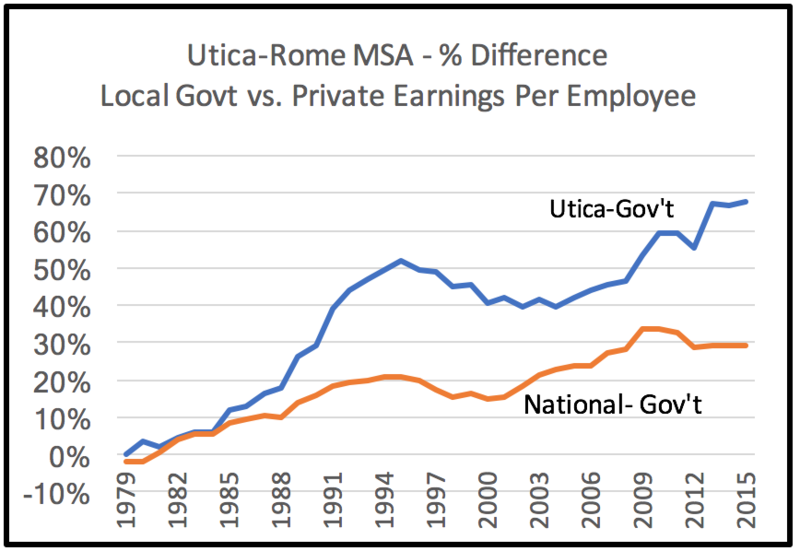 Because Utica-Rome private sector earnings per employee have stagnated compared to the national metropolitan average, the gap between local government employee earnings and private sector earnings has grown to be substantially larger (67.5%) than the average for metropolitan areas (29%). 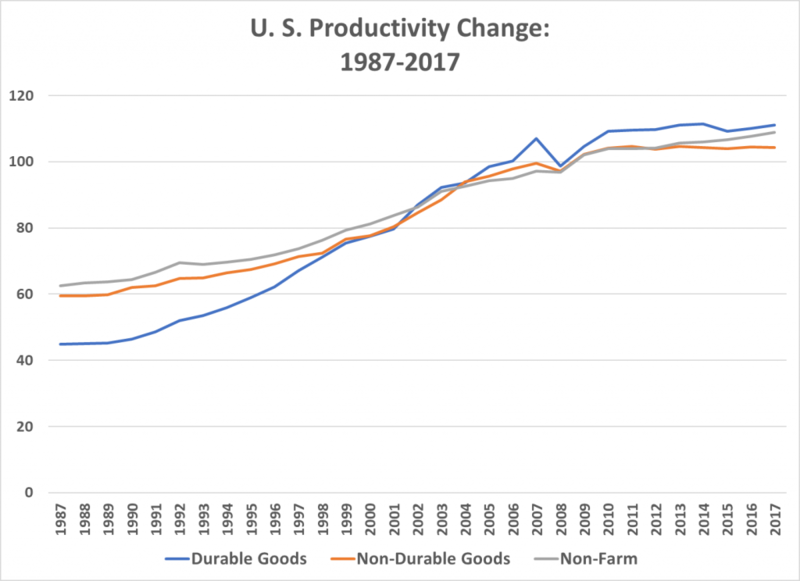 Source – U. S. Bureau of Economic Research, Table CA-5, Earnings by Industry. Data is for all metropolitan areas. The Bureau defines “Earnings … [to be] the sum of three components of personal income–wages and salaries, supplements to wages and salaries, and proprietors’ income.” All data has been adjusted to real dollars by use of the U. S. Bureau of Labor Statistics CPI-W measure for urban workers. From http://sccea.org/the-triborough-doctrine/ : In its 1972 Triborough Bridge & Tunnel Authority decision, the Public Employee Relations Board (PERB) interpreted the Taylor Law to prohibit employers from changing terms and conditions of employment while a successor agreement was being negotiated.